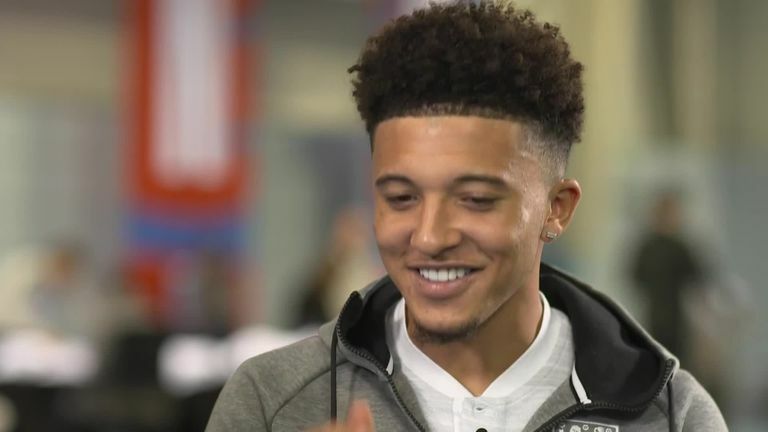 How did Jadon Sancho go from the estate to an England call-up? The Dortmund winger sat down with Sky Sports to explain his story. The 18-year-old became the first player born this century to play for England when he was a substitute in the 0-0 draw with Croatia last month, capping a whirlwind 2018 which has also seen him make his professional debut, score his first senior goal and make his Champions League debut. He also looks set to earn his first start under Gareth Southgate when England take on USA at Wembley on Thursday night, live on Sky Sports Main Event from 7pm. Sancho's achievements to date would be spectacular enough for any young player, but he has blazed a trail by uprooting himself to Germany, and Borussia Dortmund, one of its biggest and most decorated clubs. Fitting in with Harry Kane and Raheem Sterling in the England dressing room comes a lot easier when you have already done the same with World Cup winner Marco Reus and fellow teenage poster-boy Christian Pulisic, even if Sancho's meteoric 2018 has left him "speechless". However, getting to the top level of European football in the first place has not been easy. So here is Sancho's story, as told by the man himself. Jadon Malik Sancho was born on March 25, 2000 in south London to Trinidadian parents. He spent his early years in Kennington, just south of the River Thames, and that is where his love affair with football began. He told Sky Sports: "I was on an estate. There's a park behind that we called Blue Park, and we used to just go there and for two hours just play mini games, everyone used to get so into it. I used to have all the tricks, nutmeg people, and I was doing it like the older boys. "They played properly so they didn't want to hurt us younger boys. But they thought I was ready to play with them. I'd call myself a street footballer, that's where I learned my tricks and through football I looked at the big players, I think it really helped me. "Ronaldinho was a big influence on me, watching him on YouTube, he used to do things that other people didn't really used to do." A young Sancho was gaining attention and he joined Championship side Watford's academy at the age of eight, after rejecting Arsenal, who had finished third in the Premier League that year. Part of the reason behind that decision was down to constraints on his family - and things got little easier at first with the Hornets. Sancho said: "Watford was very local to me, getting to Arsenal was a lot harder on public transport. 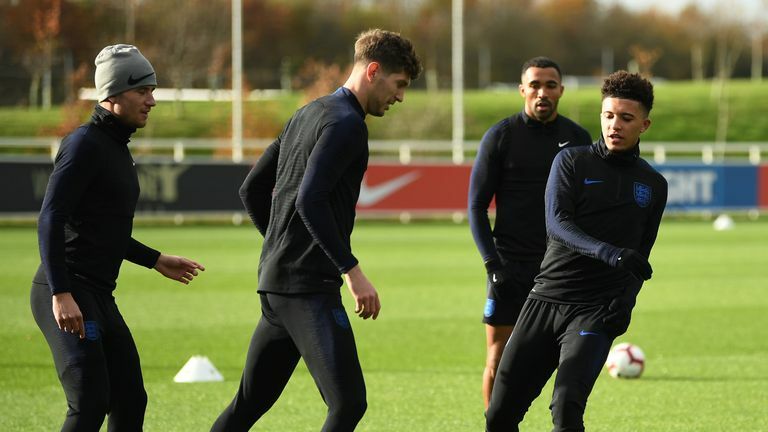 Fabian Delph said Sancho has made an impression England training ahead of Thursday's game. "It was tough for me and my family at times, with transport and work. I have a close family member called Stefan who has helped us the whole time, when I was a young kid and my dad couldn't make it. Everyone's played a part and I'm very grateful they've got me here today. "The club said they wanted me to start going to a boarding school when I was 11. Not many kids get that opportunity, but they paid for me to go, for everything. I was like - why not? Plus the area I was from wasn't too good. There were bad influences and my dad wanted me to get away from that. "It was tough at first and I had a lot of conversations saying I wanted to go home because I couldn't cope, but my family gave me a speech about thinking about the long-term and I listened to it." The Premier League would beckon again for Sancho. Having initially shown little to stand out, Sancho rose through the ranks impressing his youth coaches at Watford and was snapped up by Manchester City. But it was a call the teenager, then 14, could not quite get his head around. He said: "When they came along, I couldn't quite believe it, but I think it helped a lot. I went from being a big fish in a small pond to going to City with a lot of top players, I felt like I had to work really hard to be the best. "The players helped me. They were good players. It helped me mentally, physically, and tactically because physically wise they were a lot stronger and quicker than me. At the time, I had a lot of improvement to do coming from a category three academy and eventually I caught up and started competing." Sancho had the opportunity to stay at Manchester City and work with Pep Guardiola, but when contract talks broke down Borussia Dortmund came calling - and the winger answered, becoming one of a rare few English players to move to another major European league this century. "From Year 7, being away from home, I got over it," he said. "It was leaving home on another level, a different country, I'd never done it before and didn't know how I would cope. I felt like I was ready for first-team football, so I wanted to do something different. "Dortmund have a lot of young talented players and a lot of history, so at the time I was looking at Christian Pulisic and he was about 18 or 19, and I just looked up to him and thought I could do the same thing. "It's helped me a lot being a regular, but coming to Dortmund at such a young age, seeing how they are before and after, it's helped me become more mature on the pitch. I felt like I was ready for first-team football, so I wanted to do something different. "Being so young and playing, physically it's very tough, and the speed is very high. At first it was hard, but now I'm getting used to it. "I'm speechless. I don't know what to say about this year. I've just got to keep grounded and keep my feet on the ground. Sancho was already starting to make a name for himself by the time he and his team-mates won the U17 World Cup in October 2017 - and Dortmund's decision to recall him before the knockout stages showed his rising stock. Three weeks shy of a year after that, he found himself in Southgate's senior squad for the first time - and that's when the magnitude of his latest step caught up with him once more. "I didn't believe it straight away," he said. "When the squad actually got released that's when I thought - this is real. I went home and called everyone then, I called one of my best friends and hew as like wow, this has actually come through. "It's a dream come true. I had just finished training at Dortmund, they were just about to go home, and I got a text from one of the staff with the first team, who said congratulations you've been selected to be in the England team. "It was one of my biggest goals to play for my country. There was a lot of screaming on the phone from my mum, my sisters. There was a lot of different emotions, I'm not sure what they were doing, I couldn't' see it but I think it was happy tears. "I can earn many caps and achieve a lot of things with England. It would mean a lot to my family."